Auto-Abo, Carsharing & Co.: Does the car brand die on the way from product to service? The article is only available in German. The press release is only available in German. During their guest lecture at the University of Innsbruck, Dr. Matthias Hüsgen and Peter Schubach shared practical insights from brand management. We would like to thank Prof. Dr. Stokburger-Sauer and the students of the master course “Strategic Marketing” for the exchange and the positive feedback! Mercedes-Benz is one of the most valuable brands in the world. 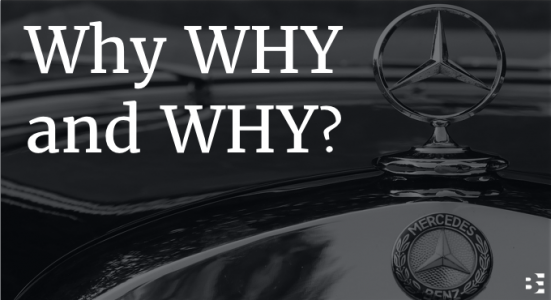 On December 8th 2017, Dieter Zetsche published the new purpose (or WHY) of Mercedes-Benz on LinkedIn. Usually, a newly defined purpose is something lasting very long, etched in steel. Not half a year later, on May 11th, 2018, he posted another article about the purpose of Mercedes-Benz. So what has changed between purpose 1.0 and purpose 2.0? Bringing the new purpose to life is taken very seriously at Mercedes-Benz. It is a long journey from the first post on Linkedin to anchoring purpose in everyday business at Mercedes-Benz. 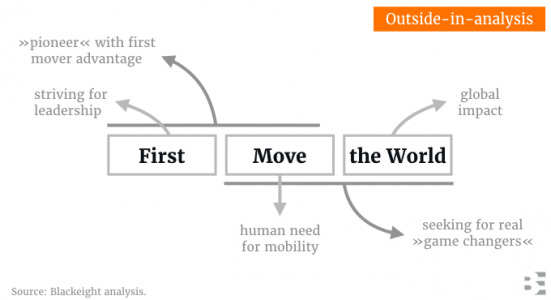 The new version »First Move the World« seems to be an evolution, not a revolution of the old version with Mercedes-Benz as self-proclaimed solver of the »paradox of the success story of cars«. Overall, this evolution is a step forward, nevertheless there are also some disadvantages. The purpose initiative of Mercedes-Benz shows that »purpose« and »brand« are strongly linked to each other: purpose will only unleash its full potential if it is linked to a brand. From our external point of view, we see three potential tasks arising. There are many indications that Mercedes-Benz takes the purpose initiative very serious. 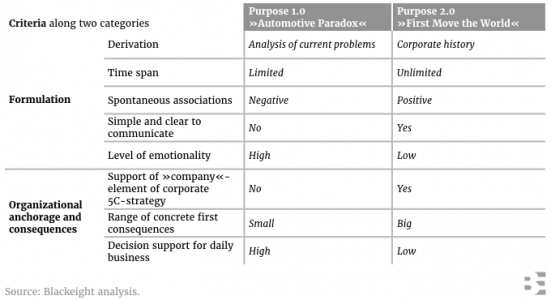 On the one hand, this can be noticed in the initialization phase: Purpose is embedded in Daimler’s leadership 2020 initiative. The fact that there are two articles about Mercedes-Benz’s purpose on Dieter Zetsche’s LinkedIn profile shows two things: firstly, he demonstrates full C-level support for the initiative and secondly, great importance is attributed to the search of the »true« purpose of Mercedes-Benz. On the other hand, this can be observed in anchoring the purpose in everyday corporate life at Mercedes-Benz: A »Purpose Activation Officer« is staffed and »First Move the World« is the official reason for the shift to CO2-neutral-car-production. Dieter Zetsche keeps explaining »First Move the World« to the employees. Recently, he gave a keynote speech at the Digital Life Day and employees are using #firstmovetheworld on Twitter. While the second article clearly refers to Mercedes-Benz Cars with its 145,000 employees, the first article mixes up the corporate/ employer brand Daimler and the product brand Mercedes-Benz. Option A: purpose 1.0 is the purpose of Daimler, purpose 2.0 is the purpose of Mercedes-Benz. Option B: purpose 2.0 is an evolution of purpose 1.0 and both refer to Mercedes-Benz. We assume it is option B. The solution of the automotive paradox is still included in the second article, but no longer as an explicitly formulated purpose – only as a corporate objective. Moreover, purpose 2.0 is much more grounded: it is clearly derived from the company’s history and has a timeless character due to its formulation. As a systematic comparative analysis (see table below) shows, the new purpose has many positive aspects. By clearly assigning »First Move the World« to Mercedes-Benz Cars, Zetsche strengthens the identity of the division and thus the »company« element of Daimler’s 5C strategy (see also »Project future«). On a strategic level, the new purpose fulfills all important requirements. However, is this purpose specific and sufficiently emotional to become a guideline for everyday? Embedding »First Move the World« in the Leadership 2020 initiative and thus to the change process of corporate culture (another »C« of the 5C strategy) indicates an inwards direction of the initiative. The aim is to reach the hearts of employees at Mercedes-Benz Cars. That is fair enough. In order to unleash the full potential of »First Move the World«, from our perspective it should also reach the customers’ hearts. It is important to note that customers (and also employees) do not think in business units such as Mercedes-Benz Cars, but in brands like Daimler, Mercedes-Benz or smart. For this reason, it is necessary that the purpose initiative needs a thorough synchronization with brand management. 1. Assign »First Move the World« to the Daimler brand to win the employee’s hearts. Taking a look at ambition: From our point of view, »First Move the World« is so broad and ambitious that all five business units of Daimler would have to join forces to deliver on that purpose. E.g. Car2Go as an innovative mobility service of »Daimler Financial Services« should be part of the movement, as well as »Daimler trucks«, which move the world by moving goods. Taking a look at activation: the process follows an inside-out logic as it targets internal change as a first consequence. Therefore, the employer brand Daimler would be the logical first lever to initiate the roll-out. The linkage of Daimler and »First Move the World« would not only ignite inside-out, but also top-down. Starting from the top, »First Move the World« can be translated and specified top-down to the subordinated brands. 2. Specify »First Move the World« for the underlying product brands to win the customer’s hearts. Before doing that, Daimler could refine their brand architecture. As of now »Mercedes Benz Cars« includes all car brands of Daimler – and thus also smart. In our option, the gap between the »premium brand« Mercedes-Benz and the »brand of urban joy« smart is wide. This could easily be solved by renaming »Mercedes-Benz Cars« to »Daimler Cars«. Accordingly, we would recommend Daimler Car AG instead of the planned Mercedes-Benz AG with regard to »Project Future«. 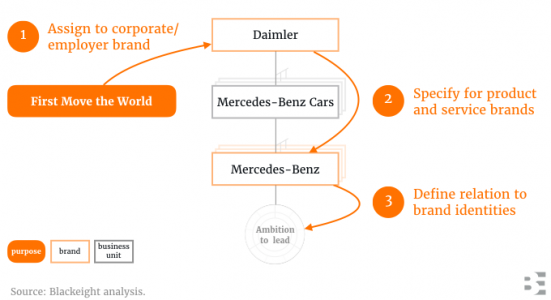 Finally, it would be necessary to discover and define the brand specific purpose of Daimler’s brands. For example, within the cars business unit, Mercedes-Benz would have to get a premium version of »First Move the World« and Mercedes-Maybach would have to get a luxury version of »First Move the World«. – e.g. for Mercedes-Benz the relation to its core »Ambition to lead« and its claim »The Best or Nothing«. Besides of the emotional benefit for end customers, this move will give guidance for day to day work of employees as well. This accelerates the targeted internal change process once again. Purpose cannot be dealt without taking strategic brand management into account. Three tasks were outlined. How many might have already been tackled internally? Do you follow the interpretation outside-in of Mercedes-Benz? How would you link brand and purpose? Which experiences can you share about the power that brand and purpose can unleash? Do you disagree? We are looking forward to having a discussion – or a »brand sparring« as we call it at Blackeight. We would be more than happy to read your comment at Linkedin! Anna Scheuernstuhl, Alumna of the Pforzheim University of Applied Sciences, followed the invitation of Prof. Dr. Brigitte Gaiser as she did last summer semester and paid a visit to her old university. Together with Tamara Ertl she gave exciting insights into current projects and explained the importance of a consistent brand management for B2B and B2C brands to the students of the Master program »Creative Communication & Brand Management«. In their presentation, the two brand consultants showed how brands can successfully differentiate themselves. A vivid discussion with the approximately 40 students brought this visit to a successful ending. Thank you very much for the invitation, Prof. Dr. Brigitte Gaiser! We look forward to coming back next year! The focus of this year’s MTP office assembly in Nuremberg was on the intensive exchange of experience and knowledge between the individual participants in various workshops and lectures. 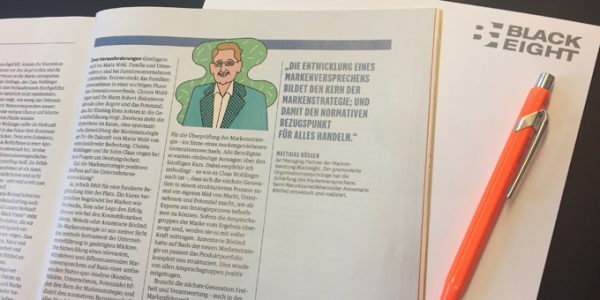 In this context Dr. Matthias Hüsgen spoke on the topic »Many brands at Blackeight« and shared exciting insights into the work of the Munich brand consultancy the 400 participants. 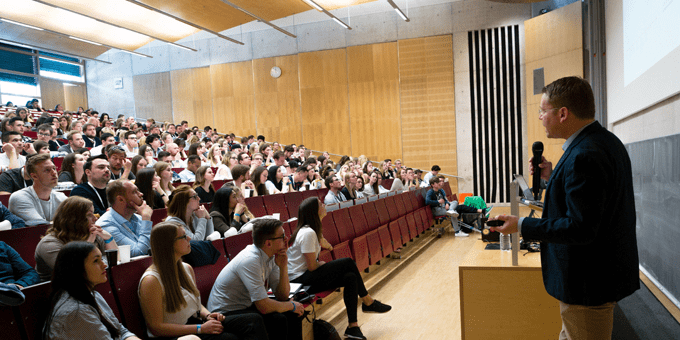 MTP – Marketing zwischen Theorie und Praxis e. V. with its network of 17 offices, 18 alumni clubs and its more than 3,600 members is Germany’s largest student marketing initiative. For one year now, Blackeight supports the Munich office as a regional sponsor. We were very pleased with the lively interest in our presentation and are looking forward to the future cooperation with MTP. © MTP – Marketing zwischen Theorie und Praxis e.V. This article is only available in German. HBM case study “How important is packaging?”: For a natural cosmetics manufacturer, the next generation is pushing for power and wants to make the brand more modern. Should the owner of the family business agree – or does she scare off her existing customers? This fictionalized case study on the power of the brand in a new generation of a family-owned company is supplemented by three expert assessments – it answers: Mr. Michael Linder, Dr. Matthias Hüsgen and Prof. Dr. Mark K. Binz to the question:”Should Christa Wohlinger agree to the brand sharpening – or does it risk too much? The article release is only available in German. 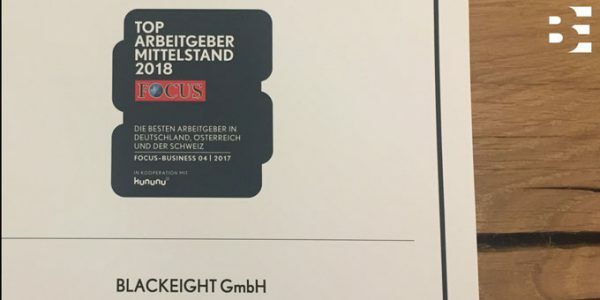 For the sixth time, the news magazine Focus, in cooperation with »kununu«, selected the best employers in Germany, Austria and Switzerland. The prize was awarded to 1,000 employers from 22 sectors, who now have the seal “FOCUS Top Employer 2018”. More than 100,000 employee judgments of all hierarchy and age groups were evaluated for this study. The decisive criterion was whether the employees recommend their own employer. In addition, the study takes into account employee ratings for other employers within the industry. For the evaluation, the judgments for the employers in each industry were counted, the selection of the top employers was based on the frequency of recommendations.